By definition a filter is a device that selectively adds or removes materials from a system. What sorts of things might you want to take out, put into a planted tank? Particulate matter, fish food wastes like ammonia, noxious chemicals, color, and more we want to get rid of or convert to plant-useful chemicals. Items you might want to add include fertilizer and carbon dioxide. The topic of filtration can be approached in several ways; most instructive are by tools, and effects. We will use both of these; the most effective means, plus the classified ways they improve and preserve water quality. Here's a point blank statement that's bound to shock a few; the ideal filter system is none at all. Follow along with me on this. Given that you have a balance of plant life, fish food et al. possible fertilizing, moderate lighting... your aquatic set-up may well stay clear and clean enough with just pruning and water changes. Most hobbyists do utilize filters to improve their water's quality; principally to corral suspended material and aid biological conversion. Additional uses include the use of chemical filtrants to semi-selectively remove matter or alter aspects of water make-up. Important also is the simple circulation of water, preventing temperature and concurrent chemical stratification. All these points we'll elaborate on below. Historical treatments of filtration typically list, define and give examples of physical/mechanical, biological and chemical aspects of filtering. Strictly speaking all three of these become blurred in actual practice; that is, filtration processes bridge and grade amongst each other in real-life filter operation. These are techniques that sieve out, otherwise remove particulates and molecules of unwanted matter. Media include two-dimensional pleated cartridges and screens, some coated with diatomaceous earth and possibly carbon(s). Better for continuous use in living systems are three-dimensional filter materials; dacron polyester, spun plastics, ceramic beads, sintered glass, open-cell sponges, and more, possibly graded large to smaller in filter order, that provide trapping space, yet do not clog quickly. An outside power filter is a good choice for planted aquariums. Some cause less surface disruption than others, an important consideration to those who want to retain supplemented carbon dioxide. Is the huge grouping of pathways by which chemical "wastes" are converted aerobically and anaerobically to less noxious, even desirable materials. In essence, excess fish food and manure, organics added as soil to the substrate, and decomposing plant matter are "cycled" readily in a microbially "established" set-up. This bio-geo-chemical cycling is very important to captive systems, and is greatly aided by intentional filtering. Concern for space here prescribes that we leave off with much discussion of how to go about inoculating a new system; I'll assume that you're familiar with the topic, and refer neophytes to the Bibliography for more. Suffice it to state biological components of filtration will "happen" in all living systems; a principal function of your filtration system is to sustain and expedite beneficial pathways. Pertinent notes follow. We'll define as the non-living removal of substances from water on a molecular level by adsorption (carbon, i.e. charcoal, activated charcoal) and ion exchange (mainly resins). These two types of media, used apart or together are valuable adjuncts to the other filtration methods we've discussed. While not absolutely necessary, they are often employed to remove color, odor, nutrients, and suspended solids; enhancing water quality, improving livestock health and reducing maintenance. There are many types of semi-confusing labels applied to these materials. Strictly speaking, carbon is the "root" element of them all. Beware of "reagent, "technical" etc. grade claims. Carbon (without the 's') will refer to as activated charcoal has a greater absorption rate and capacity than ordinary (shiny, irregularly-shaped) charcoal (from animal or wood sources). You only want activated carbon, synonymously activated charcoal; the other stuff is a chemical placebo, doing nothing. When carbon is fresh/new it's at it's zenith in adsorptive capacity. With use this drops off logarithmically. As far as chemically filtering your water, the best carbons effective-lives run about two to three months. But as they say on late night television pitches, "But wait, there's more". Carbons also act to some degree as biological filter beds and even mechanical filtration media; therefore, let it be resolved that you will rotate two (or more) sets of carbon units, along with the mechanical media as per the previous Section. Are electro-chemically charged resin beads that remove charged particles from solution by exchanging them for others. For most systems these materials are too expensive and limiting in their capacity. I am familiar with some of the research going on in the fields developing ion-exchange technology; the near-future looks bright for development of these media for our use. Are various types of not totally decomposed plant matter of use to aquarists principally for making water more soft and acidic. Commercial preparations and "loose" material for terrestrial gardening are highly variable; offered as sphagnum, lowmoor, peat molds and more. Very basically, they are prepared by sifting, rinsing in tap and possibly pre-soaking or boiling to render water soluble; placed in a "filter bag" or twixt filter "wool", and placed in a filter chamber. Alternatively, system water can be pre-treated in a seperate container for later use, or extracts derived from peat added directly to the main system. To use chemical filtrants abound. Many full-time aquarium service companies keep these media fresh to insure crystal clear water and optimum fish and plant health. Other folks are more random in chemical filtering use. They'll remember to change their carbon when the water starts to "yellow" or the colors are fading in their most sensitive specimen. For function and ease's sake, it's best to place these media in Dacron polyester bags and arrange their placement in a canister filter. Don't just throw the bag and contents into a sump or bury it in the gravel; there is not much hope of adsorption where water is not forced through the medium. Through chemical filtrant use is not a major concern with adequately fed and maintained systems. Regular feeding, proper set-up, fertilizing, and water changes assure adequate plant chemical nutrients. An easy way to separate out "other" filter modes is to consider how we'll 'drive' the water through the filter itself. Basically this comes down to variations on two themes; air-lifts and motorized water pumps. The first, air driven, is generally inferior. Except for very small volume systems airlifts can't push/pull enough water. There's also the issue of driving out desirable carbon dioxide by bubbling ambient air into the system. This leaves us with power, motor-driven makes and models. Types that agitate the air and water together are worse to those that don't for the gas dissolution reason noted above. Thus we can cross off most wet-dry, hang-on/spill back motorized filters. Instead, let's focus on the two basic winning technologies; motor-driven in-tank and outside canister filters. There are some outstanding manufactured makes of these; near-silent, low-energy consuming, able to be fitted with chemical filtrants, easy to operate and maintain. A beautiful option: An Eheim complete set-up... comes with filtration, tank, lighting... most all but livestock, substrate and water. Very nice. First and foremost a restatement of sufficiency; depending on the size, shape and stocking of your system- jar to super-tank, an air-mixing filter type or none at all may suit your purposes. Sizing: How much flow do you need or want? Functionally, enough current and force to keep the system destratified and loose material kicked about for removal, but not so vigorous as to tear the plants asunder (some plants, e.g. Cabombas like still waters). Aesthetically? You'd like as much water movement as looks good to you. There's a working definition. Practically speaking, circulation should be a few tank volumes per hour for small systems, ones of 40-50 gallons, to once or twice per hour for larger ones. Spatial Arrangement: Intakes and discharges are arranged to maximize total mixing top to bottom, left-right, front and back; intakes near the bottom and discharges directed to produce full circuit circulation. for outside canister filters, spray-bars should be placed underwater and the water pumped out parallel to the longest length of the tank. Fancy units that allow some surface water intake are a definite plus. If cost is not too dear, two (or more) filter units are preferable to one large one. Fail-safe motives, flexibility in filtrant loading & improved circulation all add valid weight to dividing the work load. What about undergravel filtration? Wet-dry/trickle filters, and and and? Other filter types do exist, and each seems to have it's advocates (see miscellaneous citation titles below). To be fair, depending on MANY factors, you can use something other than the filter types "plugged" here... but why would you want to? All of them are less efficacious than inside power or outside canister types. Pressurized outside filters like cartridge, sand or D.E. (diatomaceous earth) clog readily and cost more to power... various "reef" filters turn into nitrate factories; these and fluidized beds neglect beneficial anaerobic activity... Many rooted plants do poorly with the circulation of water that is undergravel filtration. Enough? 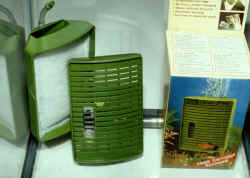 Though a planted aquarium system can be designed and assembled that does away with purposeful filters altogether; one with plenty of plants, low fish loads, moderate feeding..., most aquatic gardeners opt for filtration devices to remove solids, aid circulation, and possibly chemically modify their water. The two key elements of aquarium plant growth are lighting and "good" water quality; appropriate filtration is essential to the latter. The types of filters best employed are inside power and outside canisters; these provide plenty of force/flow, and the possibility of using chemical filtrants. The best of these makes and models are silent, low energy use, and quite easy to maintain. The consumer (that's you and me) is urged to compare media, power consumption per flow, ease of use considerations along with initial purchase price in choosing their mode of aquarium filtration. Amano, Takashi. 1998. Filtration maintenance. TFH 6/98. Anderson, Frank G. 1994. Canister filters- using and modifying. FAMA 9/94. Bockstael, Joanne. 1979. Peat and peat filters. FAMA 5/79. Bossom, Albert. 1985. The preparation and storage of peat moss. FAMA 7/85. Dewey, Don. 1978. Diatomaceous earth filtration. FAMA 2,3/78. Fenner, Bob. 1998. Live plant tanks. A question of balance. FAMA 2/98. Goldstein, Robert J. 1992. Canister filters; Their unique attributes and versatility make them more desirable than other options. Pet Age 2/92. Hovanec, Timothy A. 1993. All about activated carbon. AFM 5/93. Kutty, Vinny. 1999. The right filter for a planted tank. AFM 5/99. Mowka, Edmund J. 1974. Activated carbon. Marine Aquarist 5(1)/74. Newman, Lee. 1997. The plant filter. Going green with filtration. AFM 6/97. Ostrow, Marshall E. 1979. Aquarium plants and the UG filter. TFH 8/79. Ostrow, Marshall E. 1979. Diatomaceous earth filtration. TFH 11/79. Ostrow, Marshall E. 1980. Filtering materials. TFH 1/80. Randall, Karen A. 1999. Mega filtration. Swear by wet/dry filters or swear at them? AFM 7/99. Reardon, Richard. 1978. Peat in the aquarium. TFH 9/78. Riehl, Rudiger & Hans A. Baensch, 1996. Aquarium Atlas, v. 3. MERGUS, Germany. 1103 pp. Schiff, Steven J. 1992. An introduction to canister filters. TFH 12/92. Schiff, Steven J. 1996. Questions and answers on peat filtration. FAMA 3/96. Sexton, Richard. 1991. Aquatic plants and undergravel filters. The Aquatic Gardener 4(2):3,4/91. Spotte, S. H. 1970. Fish and Invertebrate Culture in Closed Systems. Wiley, NY. Stewart, Emmit W. 1995. An advocate of the undergravel filter. The Aquatic Gardener (hobby bulletin) 8(1):1,2/95. Sweeney, Mary E. 1995. Fluidized bed biological filters. TFH 9/95. Thompson, Richard W. 1990. Power filtration basics: the canister filter. FAMA 11/90. Vorderwinkler, William. 1965. Peat moss in the aquarium. TFH2/65. Walstad, Diana. 2000. Plants vs. biological filtration. TFH 11/2000.